Opti 3 Complete Omega-3 is a 100% natural, high-potency EPA and DHA supplement that offers the benefits of Omega-3s without the need for fish or other animal by-products. Opti3’s unique complex provides a balanced blend of 835mg total Omega-3 essential fatty acids per daily dose of 2 convenient capsules, giving you exceptional potency at a very reasonable price. The unique high-strength formula ensures adequate levels of DHA and EPA for vegans and vegetarians, whose diets are often lacking in these essential fatty acids. Opti3 is suitable for children and adults alike and is safe to take during pregnancy and while breast feeding. Omega-3 fatty acids are required by the body for general well being. Opti3 is an alternative to fish sources of DHA and EPA, as this algae-extracted version is grown in a pure environment and is free of animal by-products and contaminants. This prevents the need for worry about consuming animal products and ensures a product that is free of mercury and other toxins often common in the ocean (an issue with fish-based DHA/EPA supplements). Opti3 is also free from sugar, wheat and dairy. 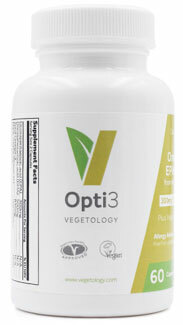 One 2-capsule serving of Opti3 contains 300mg EPA and 500mg DHA, with 835mg total Omega-3s per serving. Each bottle of Opti3 contains 60 capsules, which is a 30-day supply at the regular dosage of 2 capsules per day. $26.99 per bottle. From Kim Ward of Calgary, Alberta on 8/1/2013 . These don't have a fishy aftertaste, which is great. Best Vegan Omega 3 Ever! From Maria of Las Vegas, Nevada on 3/25/2011 . This stuff rocks! No weird fishy aftertaste or smell, easy to swallow and even has EPA. I'm hooked. From Jody of Los Angeles, California on 12/16/2010 . Opti3 is wonderful! For so long I've been looking for a great vegan EPA and DHA. This is it! Great price and great product. I recommend this to absolutely everyone - goodbye fish omega-3s!! From Martin Rodriguez of Montevideo, Uruguay on 11/8/2010 . Im really glad i found this page i live in a country where finding supplements animal-free is impossible, i bought this among whit a multivitamin and it really REALLY improved my day routine ( i train everyday like 3 hours and study) the 2 capsules serving size its kinda optional for me as it has a lot of omega3 epa and dha! it almost doesn't have any taste!